I have a huge pet peeve when it comes to Filipino food. Whenever journalists would say that Filipino food has yet to make its way to global shores, I always, always bring up Señor Sisig’s huge commercial success. Thanks to founders Evan Kidera and Gil Payumo, the Sisig dish doesn’t have to remain in its Pampanga origins or be limited as a happy hour food. Anthony Bourdain’s favorite midnight snack paired with beer is now in its rightful place. For me, Sisig served on food trucks is the best way to tell the story of this dish that’s loved by Filipinos, and the best way to introduce them to people who want to be acquainted with Filipino cuisine. In fact, at the first taste of Señor Sisig’s dishes, I was truly impressed at how multidimensional the overall concept is. A fusion cuisine, one shouldn’t discredit its Mexican execution, especially since the City is well-known for its Mexican cuisine. 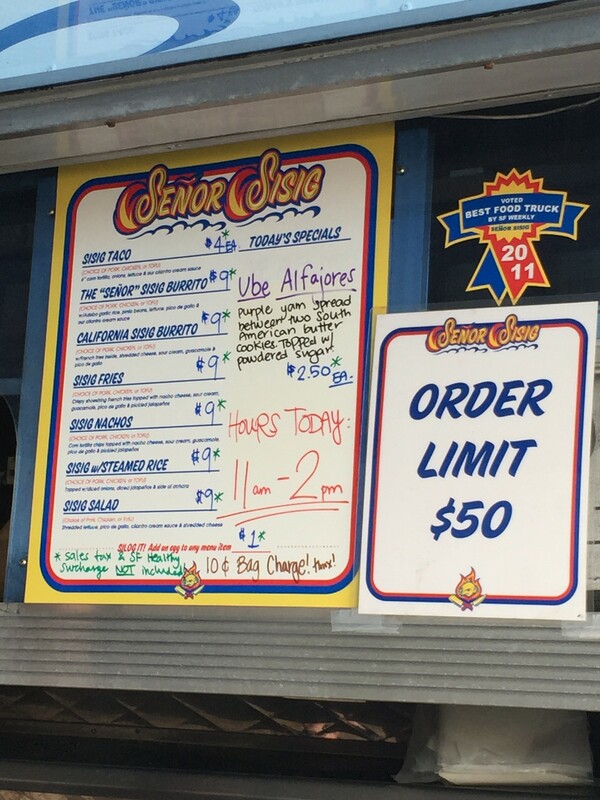 Sisig Burritos, Sisig Tacos, Sisig Fries, Sisig Nachos, and even the Fiipino staple Sisig over Rice ~ Señor Sisig is loaded with great variety of options to suit your taste. One thing to note is that this food truck doesn’t cook Sisig that is too fatty, or scrimp its ingredients like we’re used to in Manila. It isn’t all crunch, fat or innards, Chef Gil lovingly marinates the lovely pork shoulder for 24 hours. It’s no wonder people will line up to try out this revolutionary cuisine. If you want to hold the rice in burrito, you can order the Sisig Tacos. Here, you can truly taste Señor Sisig’s meat without the bells and whistles. Yum. All of their menu items offer the option of choosing pork, chicken, or tofu meat. I don’t know about you, but Sisig is best cooked using pork. The Señor Sisig Burrito is packed with Adobo garlic rice. And in all true Mexican fashion, pico de gallo, pinto beans and Cilantro cream sauce make up this signature burrito dish. Señor Sisig also pays homage to the wonderful Golden State with its California Sisig Burrito, armed with the much loved guacamole and sour cream. Surprisingly, they have Tosilog Burrito, stuffed with Tocino (sweetened pork), fried egg and Adobo garlic rice! Sweet. If it’s your first time to try Filipino cuisine, Señor Sisig will give you the best introduction to this already global gastronomy for a fraction of the price. Download Off the Grid app (iTunes | Google Play) for The Chairman’s food truck locations. Have you tried Señor Sisig? Do you think this should hit Manila shores? Share your thoughts on Candid Cuisine!